Stock-Flow norms are a critical component of stock-flow consistent (SFC) modelling. Using this concept, we can see why economic growth has become slower in recent economic cycles, in particular the latest one. Unfortunately, this analysis indicates that the current slow growth - often referred to as secular stagnation - is structural, and not easily remedied. The reason is that there is considerable demand for savings, and the only way of generating those savings is via government deficits, which only appear if nominal GDP growth is slow. Finally, the fact that the rise of government debt outstanding was the consequence of policies that were aimed at increasing growth rates has the consequence that there is little chance of "fixing the debt", as those other policies would have to reversed. The analysis herein is in a long tradition of "under-consumption" theories, which pre-date Keynesian economics. However, it is balance sheet focussed, which is a common feature of Post-Keynesian analysis, and Modern Monetary Theory (MMT) in particular. For example, Warren Mosler (blog link) stresses various "demand leakages" in modern economies, which was my initial trigger to start thinking more carefully about this topic. The theory behind this article is explained in two recent posts - my primer explaining what stock-flow norms are, and my explanation of how the demand for government bonds creates supply. As a brief summary, stock-flow norms are the relationship between the desired stock of savings for an entity relative to its income flow. An entity (such as a household or business) that wants to increase the ratio of its net financial assets relative to income will need to increase its savings out of income. Within a modern welfare state economy, an increased desire for holdings of financial assets that cannot be matched to increased private sector borrowings will depress nominal GDP growth. This lowers taxes paid, and increases social transfers. In other words, the fiscal deficit has to rise, creating the government liabilities (bonds, bills, and base money) that act as supply to satisfy the increased demand for financial assets. And the nature of accounting identities is that such an adjustment must happen; there is no way of an economic model to not produce this behaviour, unless of course it ignores accounting identities. 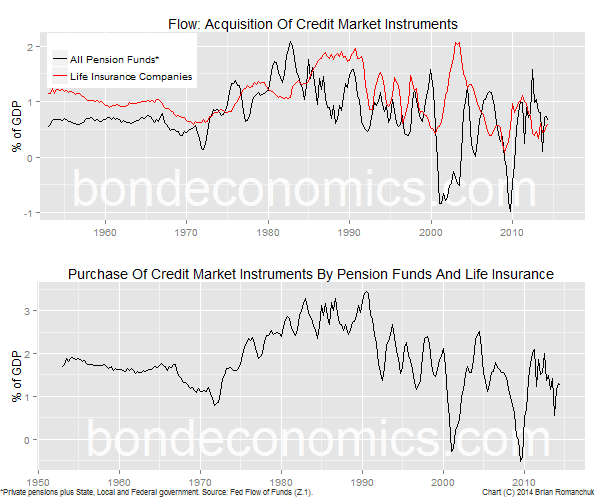 I have chosen to illustrate my analysis using Flow of Funds data for the United States. These data are compiled by the Federal Reserve quarterly, and are known as the Z.1 Release. The United States is the centre of the debate around "secular stagnation", and the situation is relatively straightforward there, at least when compared to the other developed countries. Euro area nations are locked into the fetters of a virtual Gold Standard, and so financial flows act in a different fashion. Japan has been in a secular stagnation for a long time, and I hope to publish analysis of those data eventually. The other "Anglo" nations - the United Kingdom, Canada, Australia and New Zealand - have similar tendencies to the United States, but they have other special factors that distinguish them (the U.K. has an oversized global financial centre in London that distorts the national picture, Australia has an oversized resource sector that greatly influences capital flows, and Canada's housing bubble has not yet popped). Nonetheless, they also exhibit symptoms of "the American Disease". The rise in the U.S. Federal debt-to-GDP ratio since the end of the financial crisis is well known, although fiscal hysteria has largely died down as a result of political trends and the decrease in the deficit (chart above). 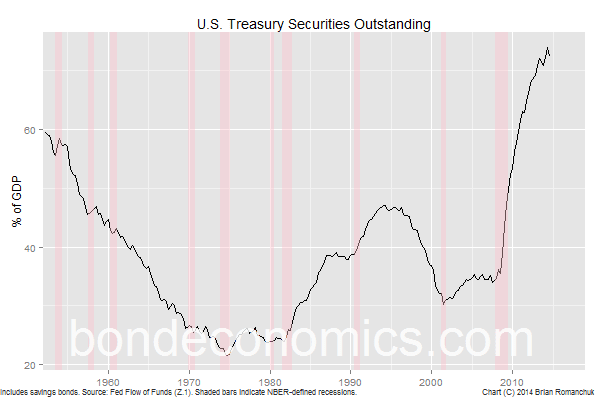 What was largely ignored (outside of the economic schools of thought that emphasise balance sheet analysis) is that the trend in the supply of Treasury debt is following the trend in the demand. The U.S. Treasury is not the only source of supply of financial assets, but it has been forced to fill in for the other sources. I will discuss the supply situation in the second part of this essay. 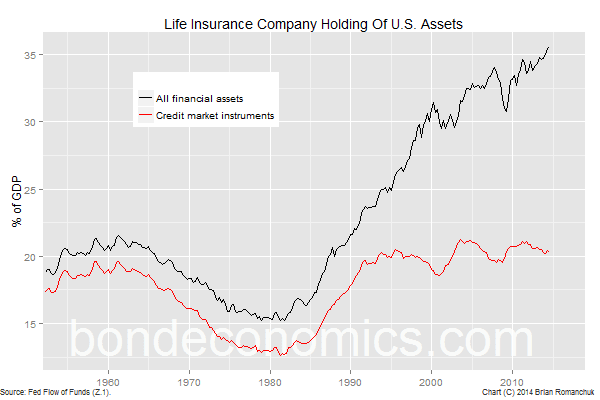 The rest of this part of the article discusses the trends in the demand for financial assets. Although I normally focus on domestic considerations when looking at developed economies, the external sector is the 800-pound gorilla of the Treasury market. The United States' perpetual current account deficits create a corresponding need for foreigners to accumulate financial assets within the United States. 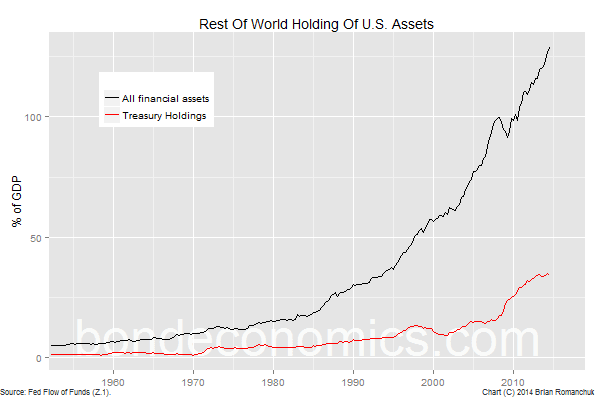 The chart above shows the "Rest of the World" holdings of U.S. financial assets as well as Treasury securities as a percentage of U.S. GDP. External holdings have risen to around 47% of the Treasury market (as of the second quarter of 2014). A significant portion of the Treasury holdings are the property of foreign governments as part of their foreign reserves. The Flow of Fund data does not segregate by type of holder; one could look at the New York Fed custody holdings data to get a handle on what percentage of foreign holdings are "official" (foreign government or supranational) holdings of Treasurys. (Foreign governments for some reason or another do not completely trust the financial sector, and often hold reserve assets directly at the central bank.) However, it appears that some governments have decided to move assets to entities domiciled outside the United States, and so the custody holdings may be capturing less of the true official holdings. However, I do not think we can easily distinguish between the "foreign private sector" and "foreign government reserves", so I do not pursue making that breakdown here. There are large "sovereign wealth funds" that often act as a semi-official means of recycling current account surpluses (for example, for the OPEC nations). Additionally, the Japanese private sector has been recycling Japan's previously hefty current account surpluses in a fashion that was quite convenient for Japan's economic bureaucracy. Since I am showing the stock of holdings, capital gains in the equity market have also helped push up the ratio of assets to GDP. Given that the duration of holdings of reserve assets tends to be fairly short, capital gains cannot completely explain the rise in Treasury holdings. In any event, there has been no tendency for foreigners to harvest capital gains. The implications of these flows are straightforward and well known. Since exports add to GDP and imports subtract from GDP, running an increasing trade deficit slows nominal GDP growth, and hence nominal domestic income growth. The fact that foreign official holders have extremely small holdings of private sector financial assets additionally makes it harder to recirculate these flows into the private sector. Weaker domestic growth depresses the tax base, and increases the Federal government deficit. This "demand for Treasurys" (or U.S. financial assets) is partially consequence of decisions by foreign nations (mainly in Asia) to suppress their currencies versus the U.S. dollar, and to limit imports. The other major source of foreign demand results from the United States' massive oil imports, and the desire of oil producers to recirculate their current account surpluses into financial assets. Changing the U.S. tax code can do little to stop this, other than by triggering a recession that stops imports in their tracks. However, recessions will raise the deficit on account of domestic factors, so this would not help the overall fiscal position. From the standpoint of stock-flow norms, what is amazing about the foreign sector is how badly calibrated their normative rules are. Normally within a SFC model, one assumes that increased financial assets will lead to increased spending out of those assets, leading eventually to dis-saving. Instead, some foreign governments continued to pile up reserve assets without any apparent desire to increase consumption. But it appears that the unsustainability of these policies finally registered, and the pace of growth of reserve assets is slowing. Demographics has driven the desired stock of assets in retirement accounts ever-higher. 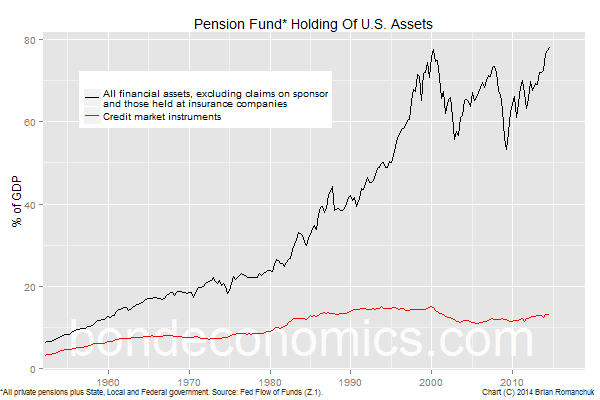 The chart above shows the level of assets in pension plans of all types - private defined contribution and defined benefit (including 401(k)-style plans), State and Local government pensions, and Federal pensions. I exclude claims on the sponsoring entity - unfunded pension benefits - as well assets held at Life Insurance companies (which are shown below). Since assets are weighted towards equities, the repeated rise and fall of stock prices is evident. Life Insurance companies, through their involvement with annuities and other savings products, are another important intermediary for retirement savings. The chart above shows their financial holdings. In both cases above, the amount of credit market instruments has been fairly stable as a percentage of GDP. But since GDP is growing, that implies a steady acquisition of assets. The chart below shows the 4-quarter average of credit market acquisition by these entities. It represents an average source of demand of about 1.5% of GDP. However, it should be noted that this demand is actually less than it was during the more inflationary 1980s. Household financial assets as a percentage of GDP have been increasing, although this largely reflects the impact of rising equity values. (In the top panel of the chart above, I excluded the value of pension benefits, as those were in embedded in the charts of the previous section.) It is difficult to see the tendency in bond holdings, as those holdings are increasingly intermediated by financial institutions like mutual funds. 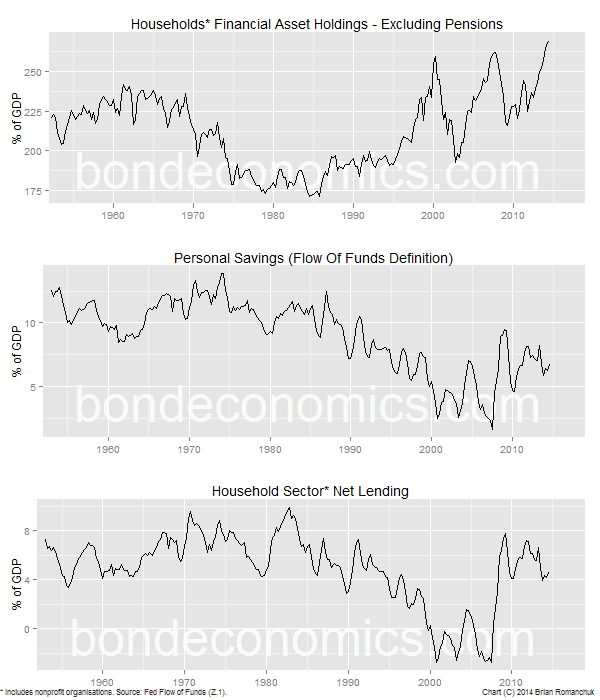 However, if you look at personal saving (the middle panel of the chart above; I show the Flow of Funds definition of personal savings, which differs from the NIPA definition), the movement in savings is the opposite of what an underconsumption theory would suggest. Savings rates were higher in the high inflation (and growth) period ahead of 1990. However, higher growth rates meant that the asset/GDP ratios were lower than they are at present, despite these higher savings rates. In terms of net supply and demand and funds, the picture is more neutral over time. The net lending of the household sector has been relatively stable over time, other than during the housing bubble period (bottom panel). This savings flow picture is not what one would expect based on the rising inequality since the 1950s. Normally, rich households save more of their income than poorer households. However, savings rates are lower. This is presumably explained by changes of behaviour over time - people at the same income cohort are saving less. However, the tendency to accumulate large fortunes amongst the ultra-rich may explain the continued rise in the ratio of financial assets to GDP. The Monetary Authority (Fed). Historically, the Fed would be a steady buyer of Treasurys in order to allow it to grow the monetary base. But after the crisis, the Fed went on a rampage buying Treasurys, reducing Treasurys available to others and supplying banks with Federal government liabilities in the form of reserves. This recent activity makes no sense, and so I am going to ignore it. Banks. Banks used to be important holders of Treasury debt, but that practice was wound down by the 1970s. Correspondingly, we have been treated to periodic banking crises that lay low the economy. At present, banks largely act as a residual holder of government bonds - they will mechanically buy bonds if other investors back away from the market (as seen in Japan). But until the crisis hit, foreign purchases and other investors pushed banks away from holding them. This trading activity keeps bond yields pinned close to the path of the expected path of the overnight rate within the banking system. Nonfinancial Businesses. No modern corporate Treasurer is going to directly hold Treasury securities other than for legal reasons or as the result of some short-term transaction. If anything, they may hold Treasury Bills within money market funds. As a result, this sector is not really a major source of demand for Treasury securities. The desire to accumulate assets by the external sector and the households sector, in particular for retirement needs, is evident in the Flow of Funds data. In Part 2, I will cover the supply of financial assets (demand for funds), which explains why rising demand for financial assets (supply of funds) is negative for growth. I will also explain why I think "secular stagnation" is not going away (although it may fade until the next recession hits), as I view it as unlikely that these structural factors will be reversed. Continued here (link). * Using the terminology of control theory, it is not technically correct to refer to the natural rate of interest (or similar theoretical quantities, like the output gap) as "unobservable" (even though I probably have done so myself in other articles). They cannot be directly observed, but they can be inferred within a model on the basis of measured variables, using something like a Kalman Filter. As an example, a core temperature in a nuclear reactor may not be directly measured, but it could be inferred by temperature measurements taken elsewhere. An unobservable variable would be one whose value cannot be deduced on the basis of measurements. Such a situation is considered to be very undesirable within engineering systems, and so "observability" (all important state variables are observable) is often a key requirement. Returning to economics, this concept assumes that the model is a good approximation of reality, which is a debatable assumption for models that use the natural rate of interest. "The Monetary Authority (Fed). Historically, the Fed would be a steady buyer ................. This recent activity makes no sense, and so I am going to ignore it." I think you explained this in a previous post. Recapping from memory, when private lending decreases, government revenues fall. On the other hand, government finance needs are steady, with the result that when revenues fall, borrowing increases to maintain the steady spending. The borrowing is coming from the Central Bank in a circular fashion: government overspends, overspending allows excess income to accumulate in the private sector, the Central Bank (who has no money to spend unless it is "printed") rents the excess from the private sector, and finally, the Central Bank lends the "borrowed money" to the government to repeat the cycle. The QE program seems (to me) too important to the economy to simply dismiss the program with "..............makes no sense, and so I am going to ignore it." I think some explanation needs to be woven into the macroeconomic analysis. I think you explained it a while back. Thanks for another in-depth analysis. Sorry about the omission (and need for correction). Historically, the Fed would purchase Treasurys in order to create money as well as required reserves. This provided the required shift amongst Federal liabilities to satisfy the banking system. This is a source of demand for Federal liabilities over time, which means there must be a corresponding supply. But the QE operations were just a rearrangement of government liabilities, and they did not create net supply or demand of funding (they changed the duration). (1) The government borrows money from the private sector - banks transfer reserves to the Treasury accounts at the Fed. If there is a shortage of reserves, the Fed will lend the money to the banks. (2) The government spends the money - sending money from the Treasury account at the Fed to bank's reserve accounts. (3) The banks end up with too much reserves, and the Fed removes those reserves in a number of ways. If they want to permanently remove reserves, they buy Treasurys. Since these operations are done in a continuous cycle, we cannot really define the order of operations. Therefore, we cannot say what operations "occur first". The preferred way of ordering it from a MMT perspective is: (2) - (3) - (1); i.e., the government spends, and then the reserves are drained. Yes, I understand about bank reserves. It seems to me that public (that is the private economy) spending decisions are based on how much money they think they have in their private accounts. These accounts are increased when government has a payday. These accounts are not reduced until taxes are paid. Yes, the accounts are "rented away" when loans are made to government, but, the accounts are still available (in full plus interest) as soon a the rental period is complete. It seems to me that QE substituted new money (printed by the CB) for "rented away" accounts. After QE, the private sector has more money in accounts and not too much more in bonds. The CB has a lot more bonds and a lot more liability for money issued. Pension Funds also hold a lot more bonds. It seems to me that all the money for bond purchase came from the loan money-multiplication process where pensions lend to government, government spends to the enrichment benefit of pensions, and pensions lend again to government. You can see that I am looking at the macro picture from the eye of the private economy. Interest rates on short term Treasuries were set below Interest on Excess Reserves. This means nonbanks can hold short term Treasuries without competition from banks under QE. I think QE made sense if you look at how banks and nonbanks accepted Fed/Treasury and Agency/GSE liabilities as stabilizing instruments in liquidity cushions backed by Fed/Treasury guarantees. Joe Leote. The initial wave of QE, which bought risky assets nobody could finnce, was helpful. But I am unsure that I follow your comment. Treasurys were always going to be viewed as a liquid instrument; the only question was around Agency securities. Brian, sorry for long delay, lost track of this posting. Although I have lost track of the reference, according to my reading, during the crisis Congress authorized Treasury to hold a fixed 79% stake in the GSEs under government conservatorship. Flow of funds show Fed and Banks taking up more GSEs under QE, at higher interest rates, backed by Treasury, while Nonbanks could take up more Treasuries, and FDIC insured deposits created by Fed under QE. Thus banks and nonbanks each gained instruments in the respective liquidity cushion while working around the imposed debt ceiling on Treasury. Joe Leote. OK. The only issue with liquidity management I can see is that the Fed has reduced the "float" for Treasurys for those outside the (Federal) Government. This reduces the potential "liquidity" of private sector investors during a crisis (since they may view bank deposits with suspicion).